One that has been associated with the Haymarket area for 150 years. Some argue that it goes back even further because a “fringe market” in second hand goods and clothes, novelties, toys and pets operated alongside Sydney’s produce market from the very early days of white settlement. PADDY’S IS NOT JUST A MARKET, IT’S AN AUSTRALIAN ICON! The origin of Paddy’s as a distinct market dates back to 1834 when Governor Bourke decided to move traders in hay and grain to a site next to the new cattle market in Campbell Street, Sydney. The move created a split among stallholders within the “fringe” market. Some had regular customers among the cattlemen and hay and grain growers, and they moved to join farmers in the new Haymarket area. The food sellers and second hand dealers also did a good trade, both in the vicinity of the market house and around the Haymarket pubs. The majority, however, stayed on at the George Street market. 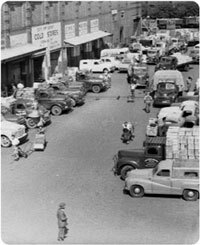 Governor Bourke’s decision to allow the market to stay open until 10.00pm on Saturdays marks the real beginnings of what we know today as Sydney’s Paddy’s Markets. By 1842, when the markets came under the jurisdiction of Sydney Council, the Saturday Paddy’s-style market was well established. The Council gave it another boost by allowing the George Street market to remain open until 10.00 pm on Wednesday nights. included trick riding, tests of strength and other fairground favourites. By this stage, the name “Haymarket” was a misnomer, as the bulk of grain and hay was now transported to the city by train and disposed of at the Redfern and Darling Harbour rail yards. The haymarket, or Campbell Streetmarket, as it was known, had become a second farm produce outlet. The stalls and side shows that sprouted up there on a Saturday, both inside the newly built market sheds and on the vacant block opposite, were being fondly referred to as Paddy’s Market. The origin of the name Paddy’s Markets is obscure, but it has been in use since at least the 1870s. It was most likely “borrowed” from England. The Irish area of Liverpool had a well known Paddy’s Market, and what went on in the empty block opposite the market sheds was in essence the same as our original Paddy’s. A Paddy’s market was an open air affair, a mixture of merry-go-rounds, sideshows, saveloy sellers, farmers with produce and animals for sale, second hand dealers, craftsmen and members of the rag trade. It was an Irish tradition – hence the name “Paddy’s” – and it was only natural that it should be constituted a new in a colony that had received 30,000 male and 9000 female convicts directly from Ireland, as well as thousands of Irish immigrants from places like Liverpool. The George Street market was demolished in 1891 and by the time these accounts were written, Paddy’s in the Haymarket had Saturday night to itself. But it too was about to change. Not long after the demise of the central market, the circus owners at the Campbell Street site were asked to find another venue. The vacant block was to be used for a new Belmore fruit market, and stall holders were asked to either apply for inside space or quit trading. That spelt the end of the fairground atmosphere that had so captivated the patrons of Paddy’s since the gold rush period. But the Saturday night market continued, and on cold wet nights, both stallholders and customers appreciated the new and elegant accommodation. Paddy’s remained secure in its new home at the Haymarket for nearly 60 years. At first the new market halls worried supporters of Paddy’s. They believed the atmosphere was too spick and span and spacious, but a few decades of city dust and grime, of bird droppings on the metal rafters and motor oil on the cement floors fixed that. In 1938, the stall holders were shifted into the large brick building, known as No. 6 market, and again the purists complained. Security of tenure ran out in the late sixties when it was decided to relocate the markets to Flemington. In the parliamentary debate on the bill, the Labor opposition insisted that the future of Paddy’s, “which has become a feature of Sydney life”, should be guaranteed. A weekend Paddy’s Market was included in the new Flemington complex when it was opened in 1975, and although Paddy’s stallholders were asked to vacate the No. 6 building in the Haymarket to make way for the $41 million Entertainment Centre, they were rehoused in the Nos. 1 and 2 markets across the way. The result was positive because Paddy’s Market doubled its capacity and it seemed that the future of the institution itself was assured. And so it remains.